Whether your chair is ergonomically-designed, adjustable, or a standard office chair, you can benefit by learning how to sit in a chair. Position your hips and buttocks as far back in the middle of the seat as possible. Ideally, there should be a small amount of space between the back of the knees and the edge of the seat. Short people may need to place a cushion between their back and the chair. Feet should be flat on the floor and the knees at hip level. A footrest can be used to raise the knees to the proper height. Consider an adjustable footrest (height and tilt) with anti-slip tread to help keep your feet in place. Lean the spine against the back of the chair so the upper and lower back is supported. A lumbar support, placed at the curve in the low back, helps to relieve stress and relax muscles. There are many types of lumbar supports including those that are inflatable. A rolled-up towel will work as a lumbar support. A good chair is equipped with armrests to support the weight of the arms. When the arms are properly supported, the neck and shoulders can relax. Many ergonomically-designed chairs offer adjustable armrests that can be swung out of the way. Chair armrests can help you to push yourself up and out of a chair by fighting gravity. Hold on to the armrests and scoot to the edge of the chair before pushing yourself to a standing position. Schedule time every half hour to get up and stretch! Don’t allow yourself to sit in one position (called static) for a prolonged period of time. Every half hour, stand up, stretch, and walk someplace for a few minutes. This will help to increase circulation, relax tight muscles, and can actually help you to be more productive! Be aware of your posture! Sit close to your work and do not slouch or slump. Also, avoid crossing your legs as this can restrict proper circulation. 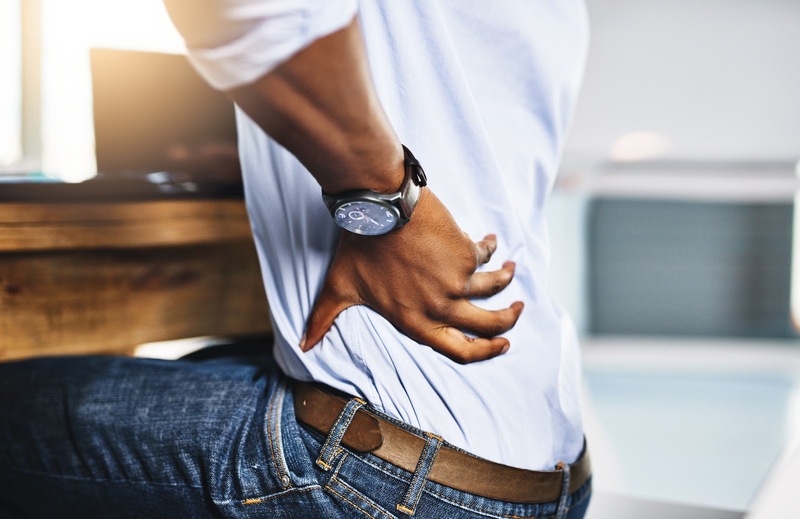 Now that you know how to sit correctly, learn how to sit at a desk and arrange the workspace efficiently to help prevent back and neck injury. Sit close to your desk; close but in a comfortable position. Desk height is important. Your desk is the right height if you do not need to bend forward to work. A work surface that is too high is better than one that is too low. Consider an L-shaped desk if your job responsibilities are split between telephone/computer and tasks that require a flat writing surface. An L-shaped desk provides separate areas for different types of work. Bend the elbows at a 90-degree angle; the hands and upper arms should easily rest on the top of the work surface. If not, adjust the chair height up or down. If the elbows are bent too much, nerve compression can cause arm pain. Work facing the desk or computer/monitor. The monitor should be centered in front of you and positioned at eye level. The monitor should be easy to see without turning the head or body. Repeatedly looking from one to side the other can cause neck strain. Center the keyboard in front of you and close. Keep your upper arms and elbows close to your body while keying. Keep the mouse close to avoid overreaching. A laptop/notebook can be difficult to position correctly on the work surface because the keyboard and monitor are connected. Consider an external monitor and keyboard so you can create a good work layout. Use a document holder or in-line stand that attaches to the side of the monitor. Position it at eye level and close enough so you avoid leaning or jutting your chin forward to view the copy. A headset is better if you spend a lot of time using the telephone. Headset use eliminates cradling the phone against the neck; , which is a common cause of neck strain. Place items used most often close at hand (e.g. stapler, telephone). Standing in one place (called static) for a prolonged period of time can cause low back pain. Try raising one foot or resting one foot at a time on a cabinet shelf, desk drawer, footstool or footrest. This simple movement changes the dynamics of the low back and helps to rock your pelvis back into a natural tilt. It also rests your stomach muscles. Place one foot in front of the other and slightly bend the knee. This movement will help to alleviate low back pressure. Stand on a cushioned mat. Avoid wearing high-heels. High-heeled shoes change the curvature of the low back when walking or standing. This can cause low back and leg pain. Do not stand with your knees in a locked position. Move around, take a break and stretch. Instead of twisting to reach for something, move using your feet. Bend at the knees, not at the waist. (Do not stoop). To reduce fatigue, lean on a solid support. Use a stepstool to reach high objects. Before you begin to lift something, assess the item’s size and weight. Test the weight by pushing it with your foot or by lifting a corner. If the item doesn’t easily move, get help. The job may require two people, splitting up the load, a hand-truck, dolly or lifting equipment. Plan a safe route to the final destination. Map out a mental picture to the destination and plan for places to stop and rest. Before beginning to lift and move the item, clear away floor clutter (e.g. electrical cords, chairs), open closed doors, and be aware of stairs. 1. Position your body directly in front of and close to the item. 2. Stand with your feet shoulder-width apart to give the body a solid foundation. 3. Tighten your stomach muscles to help support the back. 4. Bend at the knees and squat close to the item. 5. Take hold of the item and bring it close to your body. 6. The way the item is held depends on its size and shape. For example: A small box can be held close to the body by gripping the box at the bottom with the elbows bent. Bending the arms will help to distribute the weight and lessen stress to the neck and shoulders. Work gloves may help to improve grip and protect the hands. 8. Do not lift (or carry) items above the waist. 9. When carrying the item, keep your knees slightly bent, take small steps, and use your feet to change direction (e.g. pivot). One of the worst body movements is stooping or bending over at the waist to lift anything. Stooping over places harmful stress on the lower back and can cause back injury. This information is intended to provide you with the basics to help you to prevent back and neck injury at the office. If you are faced with a work spaceworkspace challenge, we urge you to discuss it with your treating physician or physical therapist.